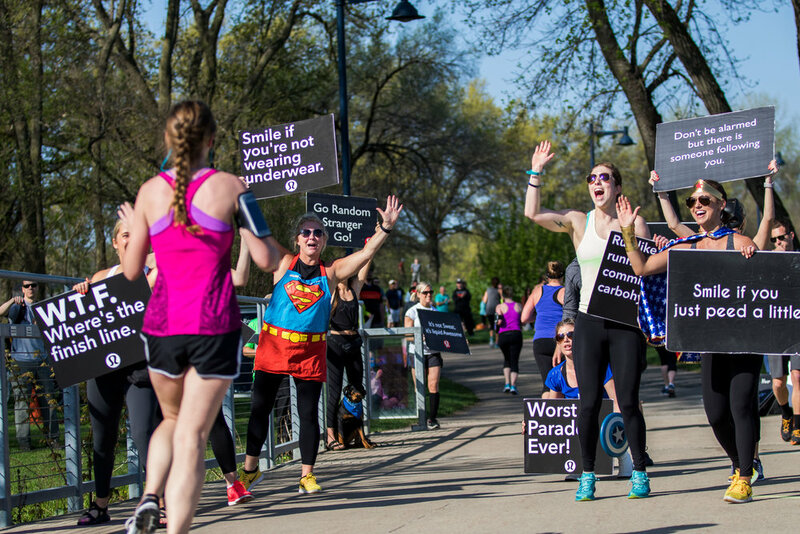 More than a race, The Des Moines Women's Half Marathon 5K + Team Relay is a celebration of strength; A stage for fierce and determined women to inspire a community. A gathering of unstoppable individuals together achieving something incredible. New in 2019 our 5k will take place on Saturday evening making it the perfect “night out.” Starting and finishing at the winery this event is perfect for women of all abilities with hundreds of first-time 5k runners toeing the line each year. The course stays close to the winery but features DJ’s, cheer squads, aid stations and finishes with a toast of wine on the Jasper Winery lawn. Pack a blanket and stick around for live entertainment, food trucks and plenty of wine. Our 5K race guide covers the race weekend essentials and will help to ensure a stress free event. A new, 2019 guide will be coming soon. The signature event of the weekend, our half marathon is packed with on-course entertainment and strong women. Starting at Jasper Winery this course runs through the south side of downtown Des Moines entering via 'The Blue Bridge.' Athletes will pass The Principal Park outfield on their way to Gray's Lake Park. The final miles of your 13.1 will be spent in Water Works Park surrounded by DJ’s, drum lines, cheer squads and a finish line party that is as big as the accomplishment of running 13.1! A comprehensive guide to race weekend tailored specifically to our half marathon athletes. A new, 2019 guide will be coming soon. Our 3-woman relay is a perfect excuse to get together with your girlfriends and work together to take down the challenge of a half marathon. Each team member will run 4-4.5 miles of our half marathon course before 'passing the baton' at our rowdy relay exchange zones. Relay teams will be given special parking near Jasper Winery to ensure they're able to finish together before raising a glass together at our post race party. Each team member receives half marathon swag. Everything you need to know for a smooth race day can be found in our Team Relay Athlete Guide. A new, 2019 guide will be coming soon. Des Moines is like the Michael Phelps of US cities, ranking at the top of nearly every list. Our DSMWHM route will take you through the heart of it all. Located in the center of Downtown Des Moines, women will run the streets, parks and trails of the happiest place on earth. The Des Moines Women's Half Marathon is proud to partner with Girls On The Run of Central Iowa again in 2019. A portion of each registration will go towards supporting transformational physical activity based, positive youth development programming for girls in third through eighth grade. We teach life skills through dynamic, interactive lessons and running games. Each season, the program culminates with the girls being physically and emotionally prepared to complete a celebratory 5k running event. The goal of the program is to unleash confidence through accomplishment, while establishing a lifetime appreciation of health and fitness. You can support GOTR of Central Iowa during the registration process or by giving them some high fives during packet pick up, at aid stations on course, or as they celebrate with you at the finish line. Want to make your 2019 Women's Half Marathon even more memorable? Choose to run as a SoleMate and help 3rd to 8th grade girls in our community get hooked on running, healthy choices and a lifetime of finish lines. Registering to run as a SoleMate comes with a free entry to the 2019 Des Moines Women's Half Marathon, a 12-week membership to the Walnut Creek YMCA in Des Moines, a half marathon training plan, GOTR tech-tee and more. Looking for a great way to support our women's movement, but not ready to register? Sign up to volunteer at our event and not only will you be helping to create an unforgettable day, you'll also be helping our friend at Girls on the Run of Central Iowa! BE PART OF THE MOVEMENT. REGISTER TO VOLUNTEER. Jasper Winery, in downtown Des Moines, will again play host to our 2019 Women's Running Weekend. Whether it's shopping at the boutique Shape® shop or enjoying a flight of wine on Saturday, or kicking back and listening to the band perform after knocking out the race, athletes love the rural-contemporary feel that Jasper provides in the heart of the city. In addition to providing the perfect ambiance and backdrop for our event, Jasper also provides a free glass of wine to all finishers of the race. We can't think of anything better. Jasper Winery hosts events of all sizes and for all occasions. Learn more about all they have to offer by clicking below.